Plastic Free July is wrapping up so I thought I would share some of my favorite ways to reduce the plastic consumption in my home and life. 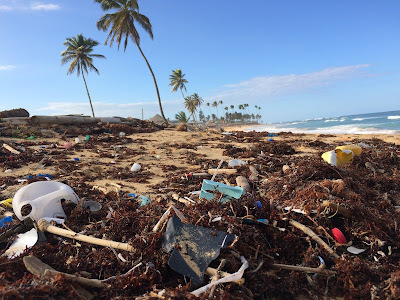 By 2050 there will be more plastic in the ocean than fish.😞 The best way to prevent this is by avoiding single use plastic like grocery bags, water or soda bottles, and to-go or single serving food containers. I will be upfront and say it is a work in progress for me and I still use far too much plastic! While I have many plastic free and reusable options, I still get a chai frappe in a plastic cup and occasionally forget my reusable bags. It's a learning process, but rather than get down about what I don't do I am going to celebrate and share what I DO. 1) The easiest first step is to use reusable grocery bags. Keep them in the front seat of your car or hanging by your front door so you don't forget them. You can probably buy basic ones at the grocery store checkout for a dollar or two. Or, if you want a cute one, you can buy from this Etsy store where I bought one of mine. 2) Once you get in the habit of carrying these with you, grab some reusable produce bags. These are nice because they are see-though and if you buy produce from the grocery store most likely they need to be able to see the code to ring it up. I keep my produce bags in with my grocery bags. 3) Many of us use reusable to-go coffee mugs. Most coffee shops and gas stations don't have any problems refilling such cups and many even offer discounts for bringing your own cup. When I recently traveled to Nebraska, I used my to-go mug to buy coffee on my trip. 4) I carry this cutlery pouch in my purse. It rolls up and stays in the bottom of my purse and is great for those restaurants that use plastic cutlery. After using, I simply wash and dry them in the restaurant restroom and return them to the roll. 5) I also have these Stainless Steel Straws. I keep a couple in my purse and some in my silverware drawer for when I make smoothies at home. 6) I don't use these as much since I don't pack a kid's lunch anymore, but when my kids were little and I packed a lunch I would use sandwich wraps such as these rather than a plastic baggie. 7) I still use these reusable snack bags when I am going to be in the car for awhile and know I will need some almonds, pretzels, or chips. They are also good to use in lunch bags. 8) I bought some Bee's Wrap Sandwich Wrap for using in place of plastic wrap for left-overs in my fridge. I still buy plastic wrap for some things, but the Bee's Wrap has replaced a good portion of what I would use before. 9) I love my to-go water bottle. I hate spending over a dollar on a water bottle when I'm out and about! Keep your water bottle handy so you can remember to fill it and take it whenever you get in your car. This bottle is great because it has a straw so it is spill-proof and has easy access for workouts. It also comes with a lid so you don't need to use it with a straw if you prefer. ICONIQ Stainless Steel Vacuum Insulated Water Bottle with Pop Up Straw Cap. 10) For my readers who are women, have you looked to switching to waste free periods? I have used a Diva Cup and cloth pads for years. It's a learning curve, but saves quite a bit of money and waste every month! 11) Finally, Pyrex 18 Piece Simply Store Food Storage Set is a great way to store your leftovers without using plastic. I have had mine for years! Obviously, these are all an investment, but I have added to my plastic free collection for the past 6 years to acquire what I have listed above. Take it slowly, add one plastic-free piece per month or per quarter. The next thing I want to buy is a 16 oz reusable cold cup with a straw for when I buy a frappe. Many coffee shops are becoming environmentally aware so I am hoping my coffee shop will make my frappe in this Stainless Steel Tumbler. Have you switched to anything reusable? What are your favorite plastic free tips? *Some links above are affiliate links and I make a small commission if you buy what I suggested. When possible, I have included links to small businesses and encourage you to shop small first....even if I don't make a commission from those shops. I only suggest things I use and love and appreciate you shopping with companies that support this blog.